Illustration “The midnight sun over Early Triassic Antarctica” by Adrienne Stroup. 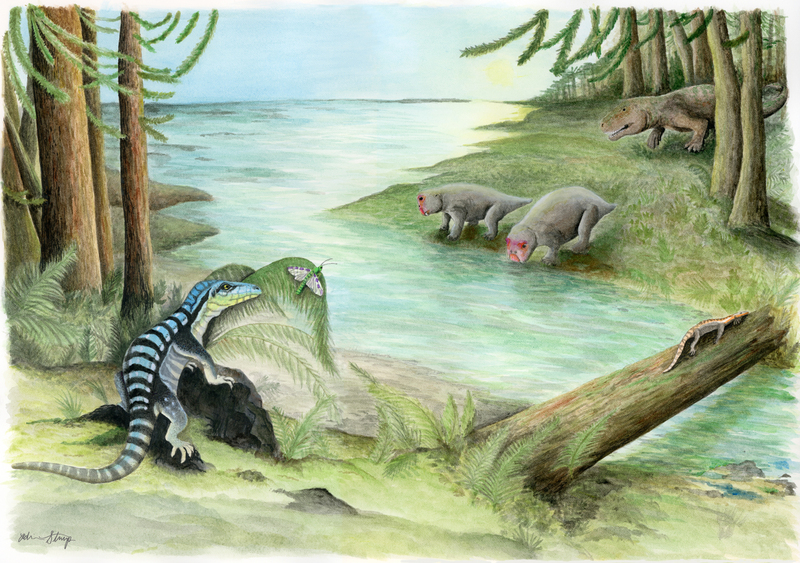 Along the banks of a river, three archosaur inhabitants of the dense Voltzia conifer forest cross paths: Antarctanax shackletoni sneaks up on an early titanopetran insect, Prolacerta lazes on a log, and an enigmatic large archosaur pursues two unsuspecting dicynodonts, Lystrosaurus maccaigi.Adrienne Stroup/Field Museum. Collected during a 2010-2011 expedition to Antarctica led by senior author Christian Sidor, professor of biology at the University of Washington and curator of vertebrate paleontology at the UW’s Burke Museum of Natural History & Culture, the fossil specimen consists of portions of the backbone, limbs and skull. The specimen is now part of the permanent collections at the Burke Museum and is one of more than 300 vertebrate fossils from Antarctica in its collection, collected over the course of four expeditions and resulting in one of the largest Antarctic vertebrate fossil collections in the country. During the Burke’s most recent Antarctic expedition in 2017-2018 Sidor led his team back to Graphite Peak, the site where Antarctanax had been found, which was also where the first vertebrate fossils in Antarctica were discovered in 1967. 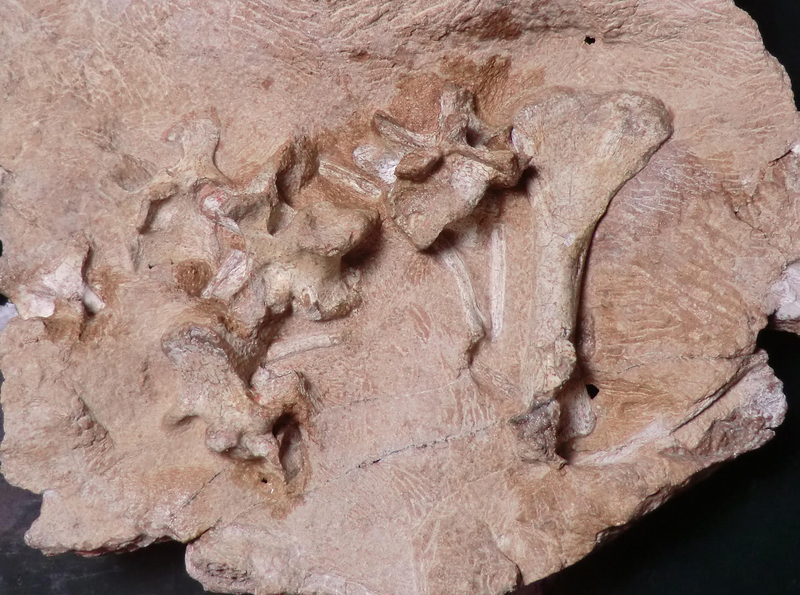 Although the new specimen is an incomplete skeleton, paleontologists still have a good feel for the animal, named Antarctanax shackletoni — the latter part a nod to polar explorer Ernest Shackleton. Based on its similarities to other fossil animals, the researchers surmise that Antarctanax was a carnivore that hunted bugs, amphibians, and relatives of early mammals. 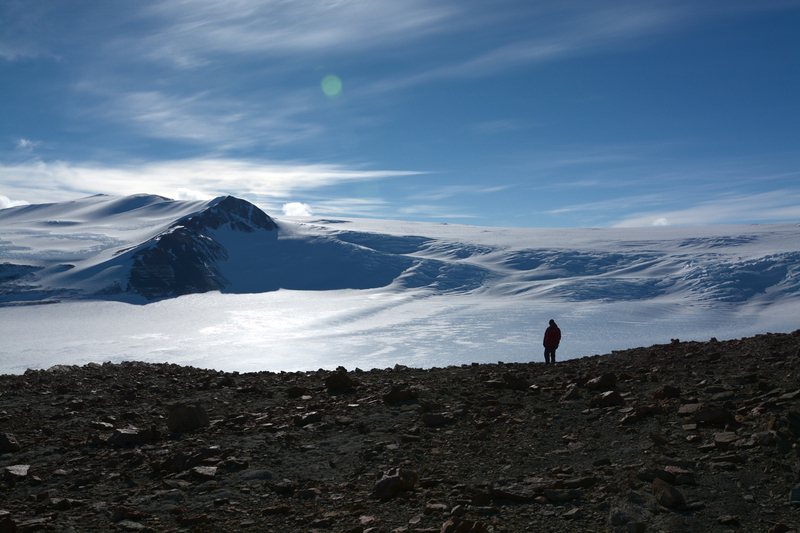 The most interesting thing about Antarctanax, the authors say, is where and when it lived. About two million years before Antarctanax lived — the blink of an eye in geologic time — Earth underwent its largest mass extinction. Climate change, caused by volcanic eruptions, killed 90 percent of animal life. The years immediately after that extinction event were an evolutionary free-for-all. With the slate wiped clean by the mass extinction, new groups of animals vied to fill the gaps. The archosaurs, including dinosaurs, were among the groups that experienced enormous growth. “Before the mass extinction, archosaurs were only found around the equator, but after it, they were everywhere,” said Peecook. “And Antarctica had a combination of these brand-new animals and stragglers of animals that were already extinct in most places — what paleontologists call ‘dead clades walking.’ You’ve got tomorrow’s animals and yesterday’s animals, cohabiting in a cool place,” he added. The fact that scientists have found Antarctanax helps bolster the idea that Antarctica was a place of rapid evolution and diversification after the mass extinction. Co-author on the paper is Roger Smith of the University of the Witwatersrand in Johannesburg and the Iziko South African Museum. For more information, contact Andrea Godinez at burkepr@uw.edu. Adapted from a press release by the Field Museum.